I’ve heard this hundreds of times – you want to get to the root of your fear and hope it will solve the problem. Unfortunately, it won’t although it doesn’t hurt to explore it. It can get into deep discussions, such as the Nature (Genetics) vs. Nurture (Environment) debate. Many years ago, I immersed myself in Cognitive Behavioral Therapy (CBT) for my social anxiety and fear of public speaking. I learned that it doesn’t help to dwell on the past and how it happened. The same goes for coaching, myself being coached, and my coaching training to my current coaching approach: it is all future focused and about how to change your thoughts and behaviors going forward. However, let’s explore how the symptoms of traumatic stress (from that first negative social anxiety or public speaking experience) may continue to affect you, whether it was mild anxiety sensations or a full-on panic attack. “One particularly severe type of fear response, one that can have powerful and far-reaching effects within the body and mind, is trauma, which occurs in response to facing a life situation that completely overwhelms one’s coping capacities. Peter Levine, in his book Waking the Tiger, describes how the body and mind react profoundly to the experience of trauma and how its effects can become fixated within the person. Levine believes that in trauma the “freezing or “immobility” response is even more critical than the fight or flight response. The frozen residue of fearful energy persists in the nervous system and often shows up as post-traumatic symptoms whenever the person faces anything that resembles the original traumatic situation. The good news is that Levine believes we have an innate capacity to heal trauma, though it generally doesn’t resolve on its own. We have to take conscious, active steps to transform and heal it. Many of us can clearly remember the overwhelming experience of feeling intensely threatened and unsafe while speaking or performing – facing the threat of feeling trapped in a situation we cannot easily exit and the possibility of public humiliation. We experienced a disarming loss of control of our inner world – something that is not easily forgotten, on conscious or unconscious level. Your body and mind processed that first flood of anxiety as trauma and has been reacting to it ever since. Is it a surprise that you experience the same physical and emotional sensations each time you are in a similar situation? No matter what the cause was, all you can do is recognize why your body and mind react the way they do and move forward to reverse your mindset and physical sensations. 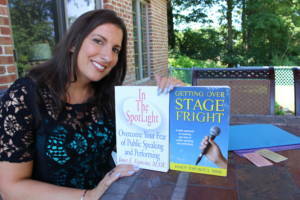 To learn more, read Janet Esposito’s book, Chapter 9: Getting Over Stage Fright: A new approach to resolving your fear of public speaking and performing.